Bruno André has published a tribute paper to Pr. Marcelle Grenson in International Journal of Molecular Sciences. M. Grenson, as Professor at the Free University of Brussels (ULB), is the founder of our lab and established many of the scientific and technical bases our our work about amino acid transporters in yeast. 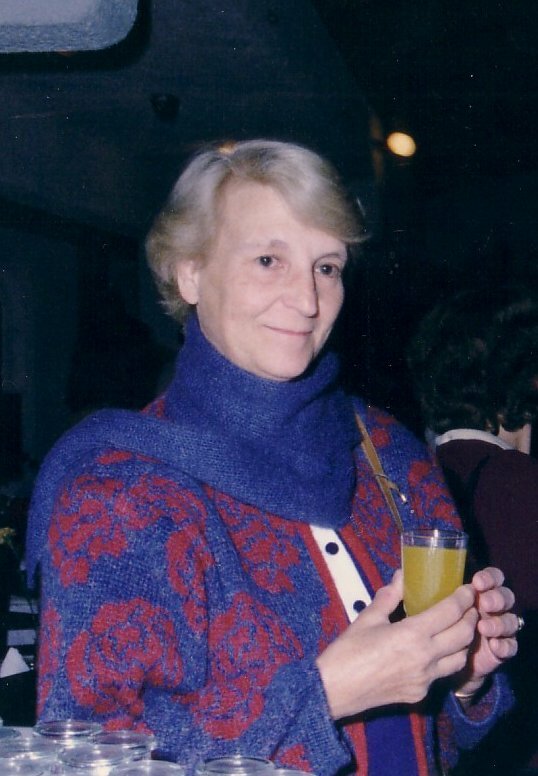 A first version of this article has been written at the occasion of the 20th anniversary of the death of Marcelle Grenson and the 50th anniversary of her first publication on yeast amino acid transport. On March 30th, Melody Cools publicly presented her PhD work and successfully received her diploma. Her research dealt with the role and regulation of amino acid transporters of the yeast vacuole used as a model to better understand equivalent proteins in the human lysosome. 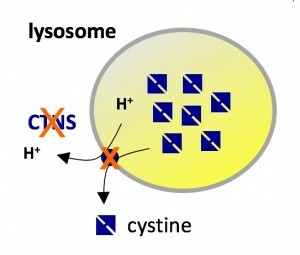 Study of these lysosomal transporters is important to better understand the cellular disorders caused by cystinosis, a human genetic disease. Melody will soon move to the lab of Pr. Joris Winderickx (KUL, Leuven) for a postdoc. Thanks a lot to her for her investment in this novel research topic of the lab. The TOR kinase complex 1 (TORC1), conserved in all eukaryotic cells, plays a central role in control of cellular growth and autophagy according to nutrient availability, and its dysfunction is associated with several diseases. The activity of TORC1 is typically stimulated when amino acids are provided to amino-acid-starved cells. However, the signal eliciting this TORC1 reactivation in yeast has remained largely unknown. We now report in eLife that it is the influx of H+ coupled to amino acid uptake (via amino-acid/H+ symporters) that triggers this TORC1 activation, and that the plasma membrane H+-ATPase establishing the H+ gradient is a central actor of this mechanism. 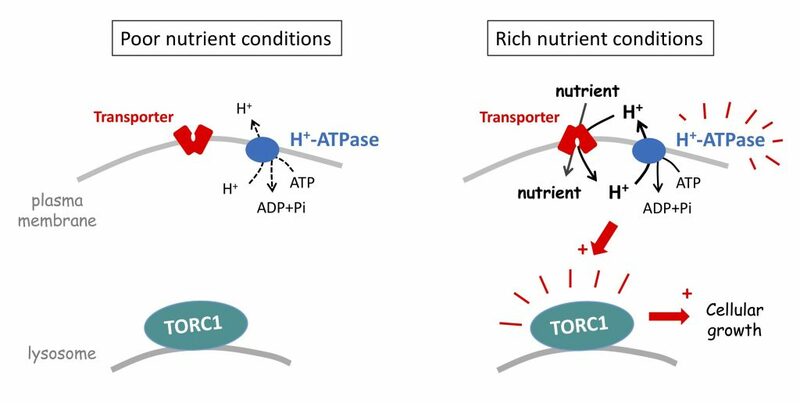 We propose the model that this H+-ATPase “senses” H+-coupled nutrient uptake and transmits this signal to TORC1. This study opens new perspectives for the study of nutrient sensing and growth control in other species. This work has been mainly accomplished by Elie SALIBA, who recently defended his PhD thesis. It also involved a collaboration with Dr. Isabelle Georis (IRMW institute). Article : The yeast H+-ATPase Pma1 promotes Rag/Gtr-dependent TORC1 activation in response to H+-coupled nutrient uptake. Elie Saliba, Minoas Evangelinos, Christos Gournas, Florent Corrillon, Isabelle Georis &Bruno Andre. Elife (in press). In a novel study published in PNAS and mainly conducted by Christos Gournas (FNRS postdoc), we report that segregation of the Can1 arginine transporter into EMCs is dictated by its conformation and requires proper biogenesis of sphingolipids. Furthermore, this clustering confers to Can1 and other transporters protection from ubiquitin-dependent endocytosis. This protective role is particularly pronounced under nutrient starvation conditions, where EMCs increase in size and number. 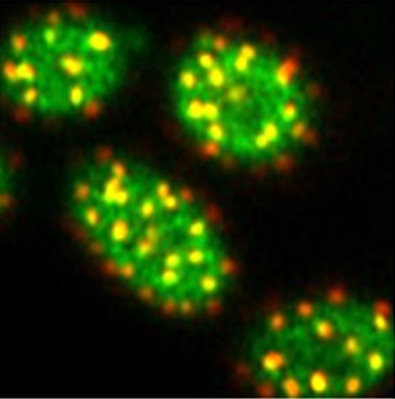 It allows cells to preserve a fraction of their nutrient transporters from bulk endocytosis occuring in parallel with autophagy, and to more efficiently resume growth when replenishing compounds are available. This work reveals nutrient-regulated protection from endocytosis as an important role for protein partitioning into membrane domains. It also suggests that EMC-like microdomains existing in human cells could ensure a similar function. This study was supported by the FNRS and conducted in collaboration with the Centre for Microscopy and Molecular Imaging (CMMI) of the Biopark and with Dr. D. Tyteca (UCL, De Duve Institute). Article : Conformation-dependent partitioning of yeast nutrient transporters into starvation-protective membrane domains. Gournas C, Gkionis S, Carquin M, Twyffels L, Tyteca D, André B. PNAS (in press). Bruno André attended to the last scientific symposium organized by the “Cystinosis Research Foundation” (Irvine, USA, March 1-2). The meeting gathered all the research groups supported by the CRF and conducting fundamental or clinical research studies on cystinosis, a rare genetic disease caused by mutations in the CTNS gene. 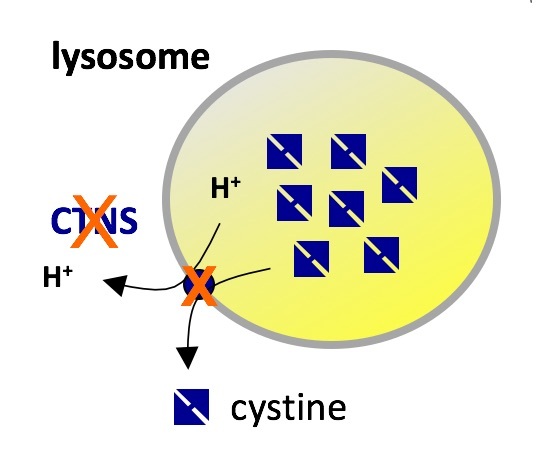 This gene encodes a transporter present at the lysosomal membrane and catalyzing export to the cytosol of cystine, the compound made of two cysteines linked by a disulfide bridge. B. André presented the work carried out in his lab about cysteine transport across the vacuolar membrane in yeast cells. 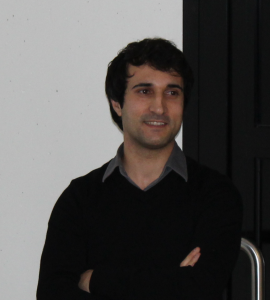 On December 20th, Elie Saliba publicly presented his PhD work dealing with a novel mechanism of activation of the TORC1 kinase complex in yeast. He has successfully received his PhD diploma. A great moment for Elie, who was surrounded by his wife, colleagues, and friends. 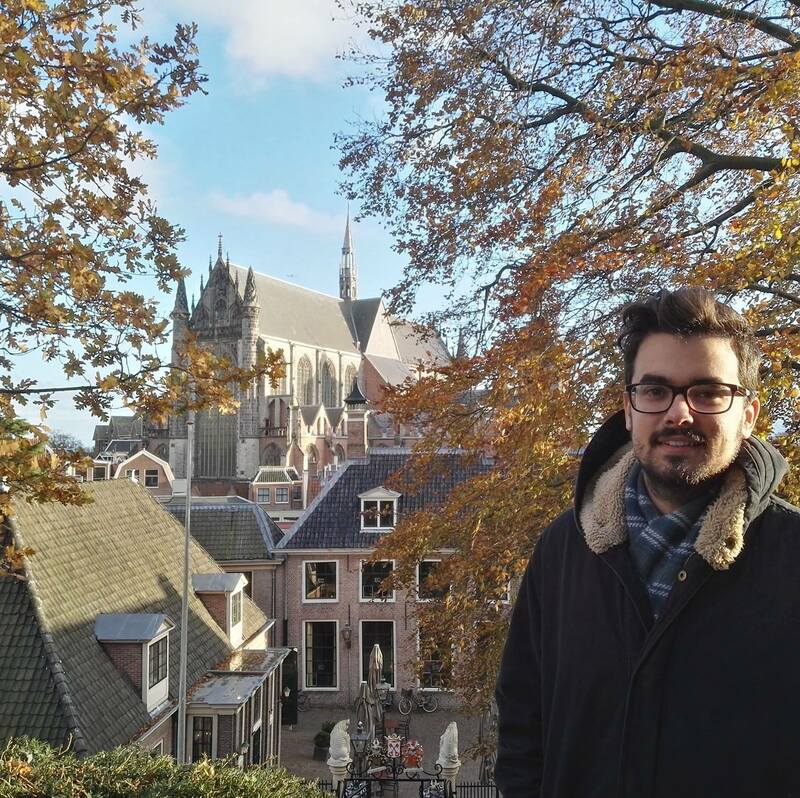 Elie will stay in the lab for a postdoc where he will pursue his work about the role of H+ ATPases in activation of TORC1. Thanks a lot to him for his key contribution to this novel research topic of the lab. Georgios Kapetanakis was informed by the FNRS that he’s among the laureates of the 2017 competition for FRIA fellowships. Georgios obtained his master diploma last year in the University of Athens (Greece). He did a master thesis work in the lab of Pr. 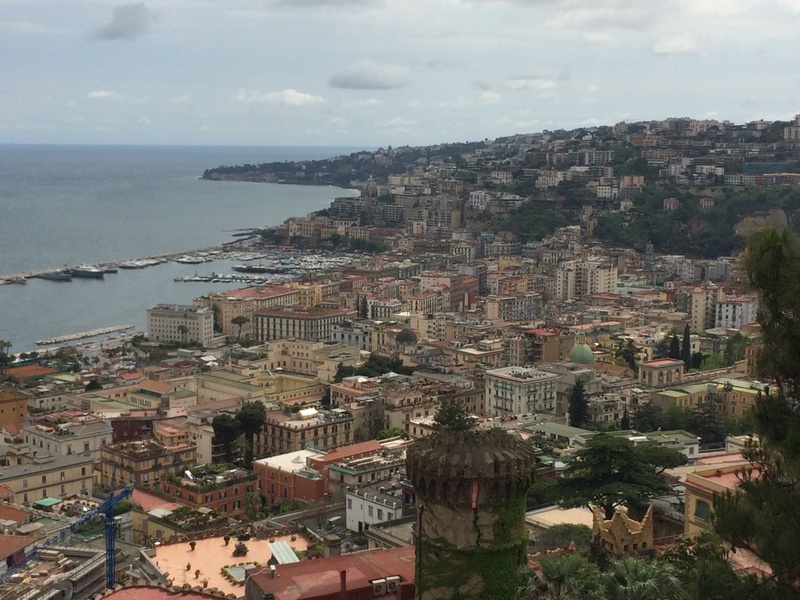 G. Diallinas where he investigated the role of membrane transporters in resistance to specific drugs by the fungus Aspergillus nidulans. During his PhD, Georgios Kapetanakis will investigate the molecular mechanisms of the still-poorly understood phenomenon of amino acid excretion by yeast, in the context of a collaboration with Dr. Isabelle Georis of the IRMW institute (Anderlecht). 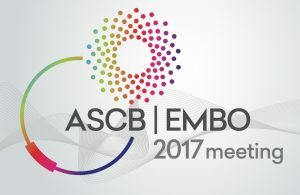 B André attended the annual meeting of the American Society of Cell Biology (ASCB) in Philadelphia (2-6 December). 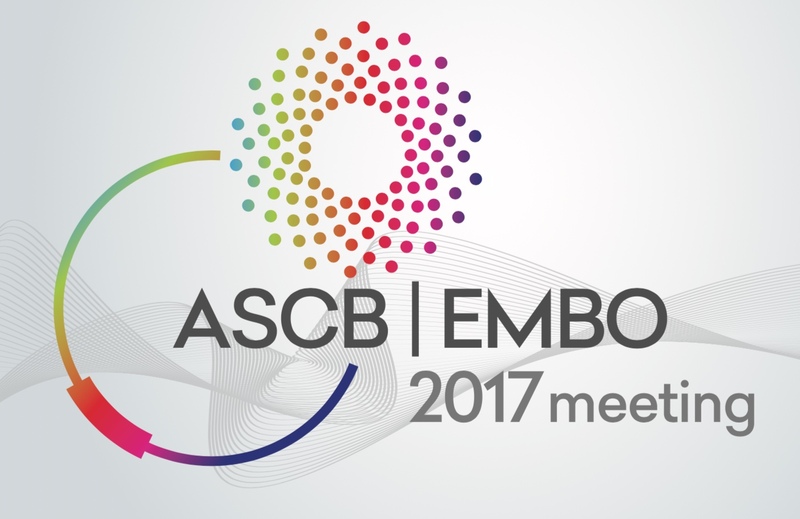 The EMBO was a coorganizer of this major annual cell biology meeting. We are pleased to announce that the lab has hired Charlotte FELTEN as a new technician. 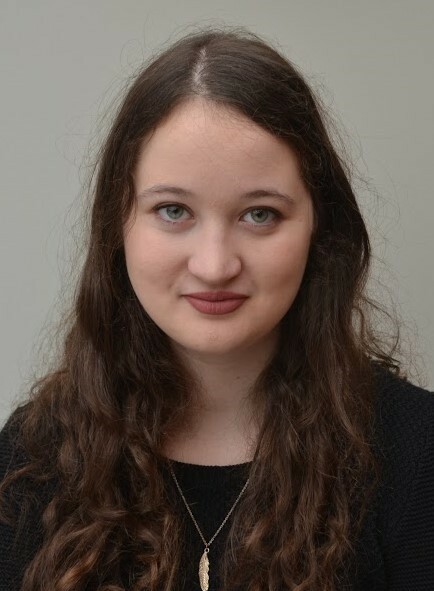 Charlotte obtained her diploma in 2017 at the “Haute Ecole de Louvain en Hainaut” (Fleurus). She did an internship in the Immunobiology group of our institute. 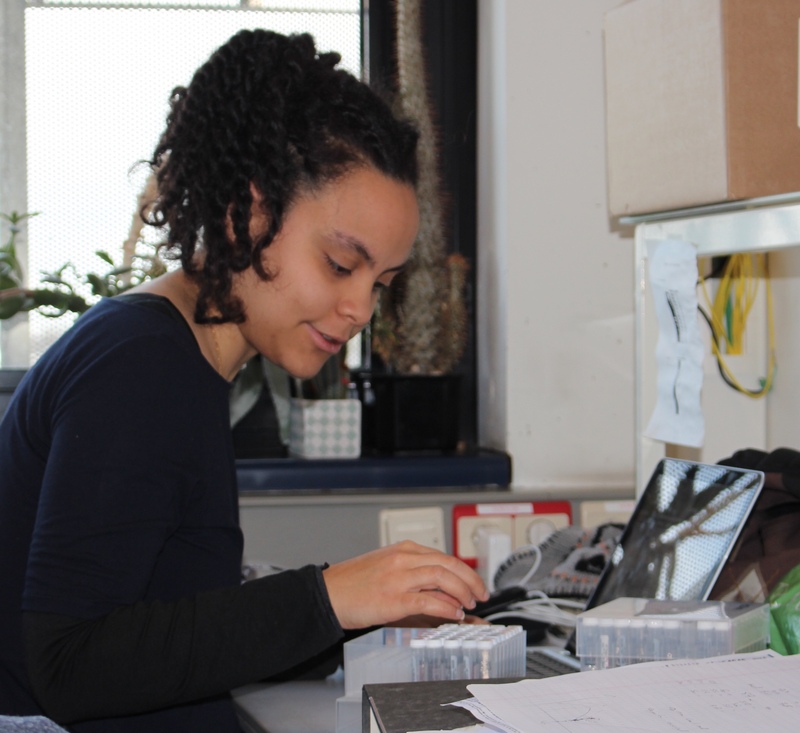 Charlotte now joined the lab thanks to a new four-year grant from the Wallonie Region.